Distribution: in all the tropical and moderate seas of the world. In the Mediterranean the sword fish is present anywhere. Coloration: dark brown back, clear abdomen. Interation with the man: potentially dangerous. Commercial value: object of sporting and professional fishing for his meats, considered appreciate. Notes: even if his form and above all his dorsal fin can remember the semblances of a shark, in reality the fish sword is a bony fish, belonging to the class of the Osteichthyeses as the most greater part of the fishes that we usually see. It has a body lengthened with a prolongation of the superior jaw, the sword, that can arrive to 1/3 length of the body. It is pointed, very strong and it allows to perforate the metallic walls of the boats. The dorsal fin is positioned immediately after the head and it is very tall, rigid and falciform. It generally swims in pelagic waters and this fish can arrive thin to 800 ms of depth. Its preys are constituted by fishes, cefalopods and shellfishes. 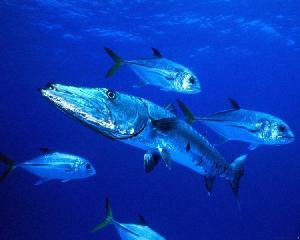 The sword fish is the fastest of the known fishes, arriving, on brief runs, to the speed of 140 km/h. Description: Strongly raider fish characterized by a lengthened face and pointed. The mouth is very ample and the inferior jaw is prominent and fleshy. The teeth are strong and present also in the palate. The back of the barracuda is generally grey-blue or greenish while the ventral part is white silvery. On the sides transversal dark gangs are visible. The dorsal fins are two, distant the one from the other and the caudal fin is blackish with pointed lobes. Dimensions: The barracuda present also in Mediterranean (Sphyraena sphyraena) can reach 170 cm The Sphyraena barracuda, that alive exclusively in tropical waters reaches instead 200 cm. 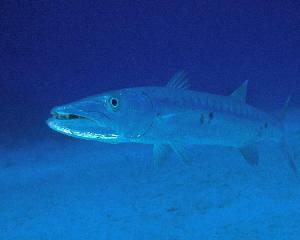 Habitat: The barracudas swim in pelagic waters in proximity of the coasts with sandy backdrop. Geographical distribution: Sphyraena sphyraena is diffused in the Mediterranean, Black Sea and oriental Atlantic. 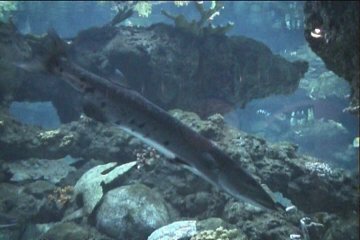 Sphyraena barracuda swims in tropical waters. 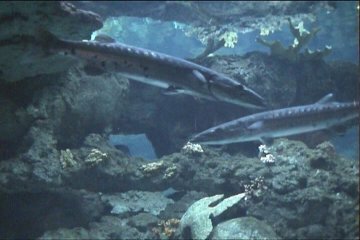 Biology, habits: The barracuda is normally associated with tropical waters, in reality Sphyraena sphyraena is not rare in the waters of the Mediterranean sea. The young barracudas swim in great flocks while generally the adults are solitary. They are voracious predatory and they preferably feed with fishes, squids and shellfishes. The preys are attached and devoured with rapid and implacable releases. Diet: Fishes, squids and shellfishes. Curiosity: The barracudas, above all if they swin in numerous benches, can be considered dangerous for the man if bothered or provoked, also because of the strong teeth. These fishes seem to be attracted by the twinkling of objects. The Sphyraena sphyraena has tasty considered meats, in the European waters the annual captures amount in thousands of tons. The barracuda is considered also prey of great value for the sporting fishing. Coloration: adults with back from grey-blue to brown with small white stains, abdomen cream color. The young samples have only a brown band among the eyes and white stains on the pectoral fins. Reproduction: ovoviviparous (viviparous without placenta). Compare with the man: harmless. Commercial value: this ray is rarely fished. Teeth: small, with more functional file, destined to the crushing of the preys. Notes: ray of very particular form, with a rounded off head and thick and a sturdy body. On the back they are present strong thorny hulls. The pectoral fins are wide and the caudal fin has the inferior lobe very developed, characteristic that does this ray swim as a shark. Alive next to the fund to depth that has gone since 3 to the 90 ms feeding invertebrates. 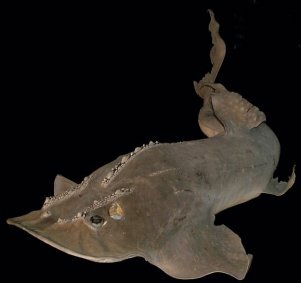 Rhina ancylostoma belongs to the family Rhinidae, great rays with body and head wide and flattened and a powerful person tail similar to that of the sharks. Also the great dorsal fins remember those some sharks, element that can provoke confusion in the identification of these rays. Distribution: western coasts of Africa, oriental and western Atlantic, Mediterranean (for the common guitar fish Rhinobatos rhinobatos). Coloration: back from brown greenish to grey brown, in some kinds with brown and grey-blue stains. The abdomen is cream color. Commercial value: these rays are rarely fished. Teeth: small, generally flat, destined to the crushing of the preys. Notes: the rays belonging to the family Rhinobatidae is characterized by a body very flattened, two dorsal fins prepared in behind position of the ventral fins and a caudal fin unprovided of the inferior lobe. They are endowed with a pointed rostrum and flattened. They swim next to the fund, mainly sandy and muddy, from 75 up to 200 m of depth, plundering small fishes, molluscs, shellfishes and echinoderm. These rays are more numerous but of smaller dimensions in comparison to those belonging to the family Rhinidae.